The main pulse valve have just one moving part, the diaphragm, a unique springless construction in most design, provides fast opening and closing of the valve. This high speed operation, not only saves compressed air, but it provides the kind of shock wave necessary to free the dust from filter bags. For controlling the Pulse valve either for mounting directly on the flange or for remote control, solenoid pulse valves are available. They are specially selected for high frequency operation required for dust collector duty. 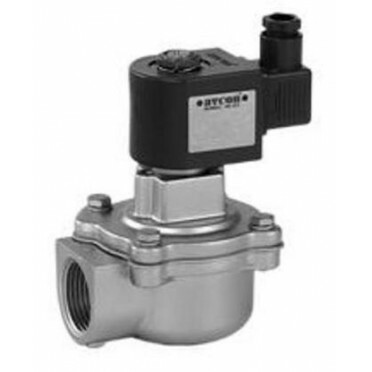 Pilot solenoid valves can be mounted individually. The valves listed in leaflet 9150 are provided with continuous duty, class 'H' insulation moulded coils. They are available for AC and DC supply, rated to 18 VA on AC and 12 watts on DC supply. Every solenoid valve before leaving our factory undergoes high voltage insulation breakdown test as per IS 2071 part II of 1974. Coils are built suitable for industrial working voltages for AC and DC supply. Features & Specification :2/2-Way Pulse and Pilot ValvesValves For Dust Collector ServiceThe mai.. Features :2-Way Ball Valves In Plastic Body with Pneumatic Rotary ActuatorType 2372K Series are Full..